Yesterday I purchased the movie, "Gandhi" from iTunes. This movie tells the story of Mahatma Gandi in a grand and glorious manner! 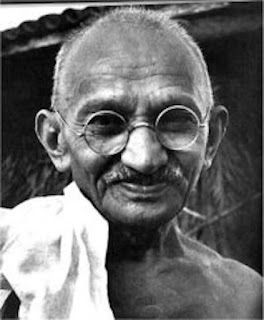 Gandhi led his people to freedom in such an extraordinary way. Not by hostility. But by peaceful resistance. How much time every day should a person spend considering what is important? I do not know the answer to this question. However, I suspect that at least a few moments would be the answer that leads one in the right direction. 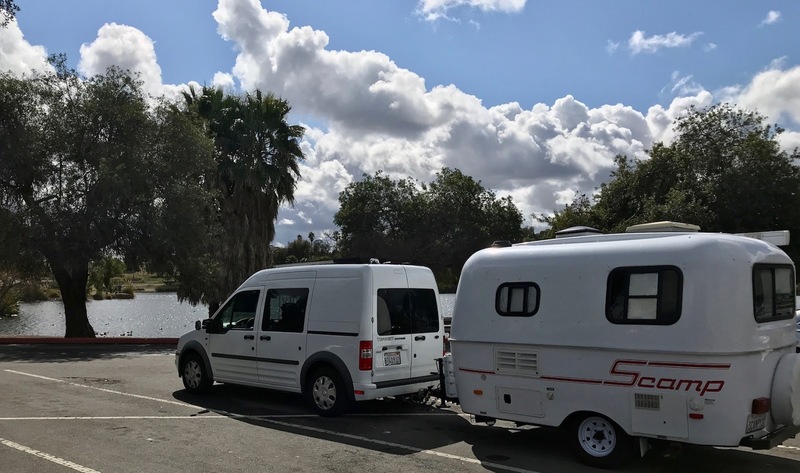 In my travels with the Scampy Team, I've noticed that RV dealers all over California and Oregon have their lots overflowing with trailers and motorhomes. Is it possible that RV sales could go up and up forever? RV dealers seem to believe the answer to this question is, "Yes!" My experience in predicting the future has been rather unsuccessful. Sometimes I am right about what will happen. Almost never am I right about when something will happen. So, I've been spending time recently considering when the economic direction will change from up to down. I have been given a remarkable chance to do something that I've always wished to do. Now I have the time to educate myself. I've chosen history as found in videos in order to learn about great people and great events. This morning while doing my laundry, I viewed a video about President Harry S. Truman. Our 33rd president [Link]. Remember that I Blogged to you that I mislaid my new eyeglasses while shopping in a Rite Aid store? After going back to that store several times over a few days and not finding them, I ordered replacement eyeglasses from my optometrist. These eyeglasses have oversized hinges and should not break as my eyeglasses have done in the past. In order to arrive at a decision about what to do about the bills from Verizon, I Blogged to you about what to do. Also, I put the situation to friends. The situation is that Verizon charged me for service after I had left them and had already begun service with T-Mobile. Further, Verizon appears to have overcharged me for service while I was with them. Even further, Verizon sold me equipment that did not work and would not [Could not?] rectify the deficiency. This deficiency led to my moving to T-Mobile. T-Mobile has a program to attract customers which consists of paying off equipment charges for new customers who come to T-Mobile from other communication providers. This pay off was substantial. $740! I considered just keeping that $740 myself since, in my opinion, Verizon gave me poor service in addition to overcharging me for service while I was with them. But my final decision was to pay Verizon the $740 because that is what my values told me was the right thing to do. 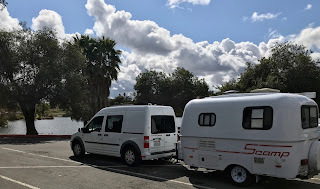 The Scampy Team is Day Camped at the Regional Park at Lake Murray in the City of La Mesa California. This is one of the places that we go often. It's a peaceful place. A lot of people here. Yet, still peaceful. 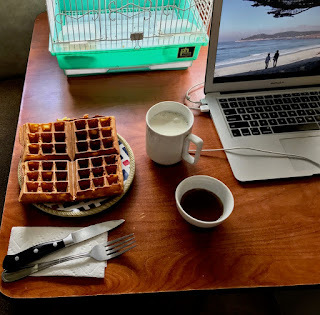 Our breakfast plan is a crisp Belgian Waffle. Yummm! PS: At breakfast this morning, Clint Eastwood's "Play Misty For Me" was on. Boid and I are different species. However, we have things in common. And, one of those things is music. We turn on music held by Little iPhone first thing after waking up each morning. We have recently added some music to our library. Boid and I have no clue why we like the music that is in our library. After pondering about what to do about my missing eyeglasses, I decided to phone my optometrist for advice. He advised me that he would be able to replace my missing glasses and give me 60% off. So, that's what I've done. Bought replacement glasses from my eye doc. The frames have very strong hinges. I've had problems with hinges breaking. These should last a long time. If I don't lose them! In the meanwhile, I'm getting along with my old glasses. I'm making this Blog post so that you'll know that I am OK. Just messing around. Maintaining Scampy and Transito. But what do you expect from an ancient fulltiming RVer? An adventure every day? Not gonna happen. Right now, we are Afternoon Camped at one of the best 24 Hour Fitness joints in San Diego. Later this evening, when there are not too many members in the club, we'll go in there to work out a bit. In the meantime, I'm watching Clint Eastwood's movie, "Heartbreak Ridge." Later yesterday evening I returned to Rite Aid to look for the missing eyeglasses. I looked in store aisles where I had not walked with the idea that perhaps the glasses dropped to the floor and skittered away. Nothing! When I left Rite Aid while driving thru the parking lot, a lady backed her car out without looking. The rear of her car knocked off Transito's driver side mirror! I was able to reattach the mirror. The next day, I returned to Rite Aid to see if the missing glasses were turned in to lost and found. I actually found three eyeglasses that looked very much like the missing glasses. But, they were not my glasses! After breakfast, I was cleaning up when I noticed that the top of the toilet room door's piano hinge had come loose at the top of the door. I went to Ace Hardware and bought 1-1/2" long screws to replace the 1/2" existing screws. That did the trick! It's really terrific not to have the responsibilities that I had when I was younger. A little while ago, I was thinking about what I wanted to do today. Also, lately I have been spending time on improving the foods that I eat. Tuna Salad is a meal that I not only enjoy eating, it is also good for me. Bagged coleslaw is used for the salad. Tuna Salad was added to my menu only recently. What do you think? Is this life of mine easy, or what? The Scampy Team is Morning Camped in the parking lot of 24 Hour Fitness on Balboa in the City of San Diego. During breakfast [Tuna salad on Matzos] the movie Terminator was playing. Even though the sound of the movie was coming thru amplifying headphones, it was not loud enough. Searching online, we found an APP from Global Delight named Boom2 which claimed to achieve remarkable sound improvement. When we used Boom2, it worked great! I am sooooo happy about that! Twayler, our large trailer, remains stored at Lone Wolf Colony RV Resort in the City of Apple Valley, California. We have not actively been attempting to sell Twayler. The main reason for not trying hard to sell Twayler is that we may wish to live in Twayler someday. We cannot know what the future holds. It may be, that I will remain healthy for many years. If not, Twayler may be a good place to live. I drove MsTioga home on the 25th of February, 2003. The anniversary of that date is coming up this month. That date marks the beginning of my fulltiming life. 15 years ago [Link]. After the big accident that destroyed MsTioga in 2014, I had heart surgery and lived at Guava Gardens Apartments for two years. But now, here I am. Back fulltiming again. I know that the last day is coming for me. The last day for me to be an RVing fulltimer. But until then ..............! I have these dreams about problems that actually do not exist. I know that sounds weird. It seems weird to me too! The weirdest part of these dreams is that when I wake up, these problems remain to be resolved in my mind. Sometimes it takes a short while for me to get it straight and realize that I just dreamed the problem up. Then, when I realize that the problem was just a dream, I get so happy about not actually having that problem to deal with! It takes a long time to clean up Scampy's kitchen after cooking. If I do not do a really good job cleaning up, then the kitchen dirt accumulates. I detest when Scampy is dirty. Since Scampy is mostly white in color, dirt really shows. Do you recall me Blogging about washing my hands several times a day in order to keep from transferring dirt from my hands to Scampy's white walls? Since I began this hand washing routine, Scampy is looking much better. Even so, every day I have to spend perhaps an hour on keeping Scampy clean. Not that I have other more urgent things to do! When one of our propane tanks goes empty, likely it's at nite. It's the cold temperature that alerts me. So, I went outside to move the cross-over valve to the full propane tank. This is easy to do because the propane tank cover has an easy access panel to that valve. When I tried to open the full tank's valve, I did not have the strength and had to use a channel lock pliers. Not being able to open that valve with my hand kinda bugs me. But, that's one of those blessings that come with age. Gotta love it! I've just returned from picking up my new prescription eyeglasses from Newport Avenue Optometry in the City of San Diego. Now that I am wearing these new eyeglasses I realize that I should have gotten new prescription glasses several months ago! Everything I look at now is in sharp focus. Not greyish as with my old glasses. As I Blogged to you before, my eyes are in good shape. No macro-degeneration. No glaucoma. Some cataracts. All of my life I have paid my debts on time. Beginning about ten years ago, I began having disputes with phone service providers. AT&T, T-Mobile and just recently, Verizon. Also with HSBC bank. With each of these companies, I tried to resolve the debt. I was not able to do it! These companies would not own up to billing and accounting errors. Each of these companies turned the disputed amounts over for debt collection. The big threat of a collection agency is that my credit rating will fall and I will have a tough time with credit. We have traveled east to the City of La Mesa. On the way, we listened to an Audible book titled: "A Higher Call." A true story of the air war in Europe. "The Higher Call" is told from the view of a German fighter pilot. Unusual. We are also here to return library videos which are due soon. There is a Chinese restaurant here that I really like because of their delicious pork chops. Both Baby Boid and I need water. Boid's water cup is changed every morning. Boid's water is replenished from my 1-liter sports bottle. My goal with water is to drink 2-liters per day. Often, I drink perhaps 1.5 liters on many days. Our water is carried in a 3-gallon water dispenser that contains a convenient valve. We refill this 3-gallon dispenser at Glacier water machines. Last nite we made a Nite Camp up on Clairmont Mesa. We've been camping there a lot lately. After taking care of Boid and shaving etc. We went to 24 Hour Fitness only 3 miles away. In the 24 Hour parking lot we met an RVer named Dave who was camping on the street for the last 6-months. Dave has a nice RV. But he himself did not look like a happy guy. He does not know hardly anything about Nite Camping. Last nite I heard a whirring sound. After turning off the music playing, I could hear the sound of the water pump cavitating. That meant that the fresh water tank was empty! I don't hardly ever let the water tank go empty. This time, it got by me! So, first thing this morning, we traveled to South Shore Park where there is an RV dump station with fresh water. This morning I wanted to make French Toast. However, just yesterday I used the last of my Jewish Rye bread. I went to Vons to grocery shop. Vons is a kinda expensive place for groceries. But Vons carries Oroweat brand bread. Oroweat offers Jewish Rye at Vons. There is something about rye bread that keeps it fresh for many weeks. And, there is something about Jewish rye that tastes so good! Much better than other rye bread. 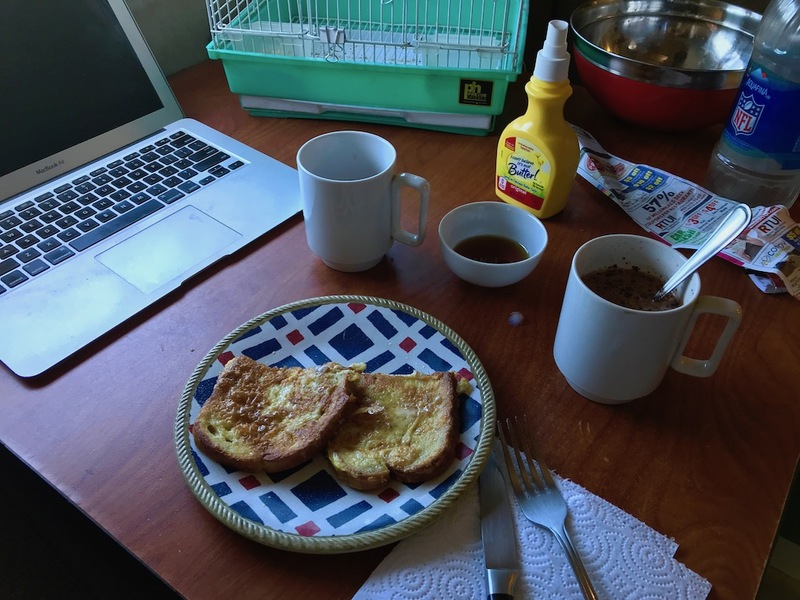 The breakfast plan this morning is French Toast made from Jewish rye. A cup of Trader Joe's hot chocolate. Apple juice. There are only two exams for me now. Skin and eyes. All the rest of the exams that I used to have at Kaiser, I eliminated when I stopped taking medication in 2016. Today is my eye exam. The office is near the ocean. So, we have traveled to Mission Bay to be close. Boid is a gentle guy. He has never bitten me. Boid lets me pet his breast. He comes out from his cage in order to search around the desktop. One of his favorite things is to look at himself in objects that reflect his image [ie: iPhone, window label with mirror back].